Solid construction makes AiroPro first in reliability. The exterior is a beveled nonagon design composed of 6082-T6 aluminum alloy, rendering it practically unbreakable. It’s a pleasure to see as well as to hold, there’s a comfortable weight to it. Still, AiroPro’s stunning look and feel are no more impressive than how well it actually works. 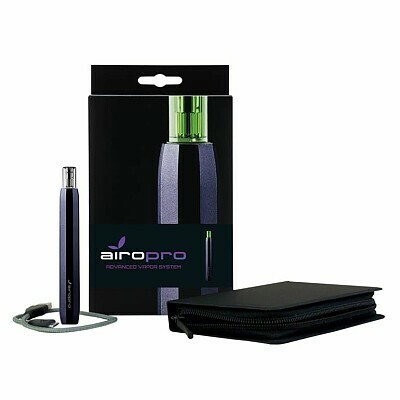 Considering discretion, AiroPro dispensed with the light-up hit monitor commonly found in older devices. Instead, vibration acts as a multi-status indicator. When the unit is in use, it can physically be felt. When the battery is low, vibration breaks into short pulses. Additionally, the fine-tuned airflow means taking a pull is always smooth and easy. The power source is a long-lasting 320mAh lithium-ion battery that’s rechargeable via micro-USB port. This makes the AiroPro the most powerful vape pen on the market—capable of delivering triple the vapor of any competing brand. It can even be used while charging, so there’s no downtime. An LED ring located on the bottom of the device conveniently indicates charge status; red means charging, green means charged.